Prof. Zaumseil has received an ERC Consolidator Grant for excellent young researchers by the European Research Council (ERC). Press Release. Marcel Rother received the „Dr. Sophie-Bernthsen“ Award (Uni Heidelberg) and Jan Lüttgens the special award by the „Kaufmann-Peters” Foundation (Uni Heidelberg). Congratulations! Dr. Claudia Backes receives the first Lautenschläger Award for a junior researcher endowed with 25 kEUR for her work on liquid exfoliation of 2D materials. Congratulations Claudia ! Both Felix Berger and Marcel Rother won an IdEX Poster Award at the ICOE conference in Bordeaux (France). Dr. Karl Eicken Prize by the Faculty of Chemistry ! 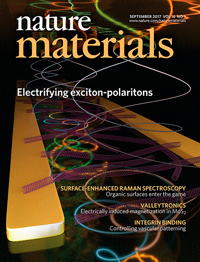 Our paper on electrical pumping of exciton-polaritons has made the cover of the September issue of Nature Materials and was highlighted by a News & Views article by Jeremy Baumberg (Cambridge). Jan Lüttgens won the best poster award at the International School on Polaritonics and Photovoltaics. and will organize a workshop on “The role of defects in novel solution-processable semiconducting 1D and 2D nanostructures” at the IWH in May 2018. 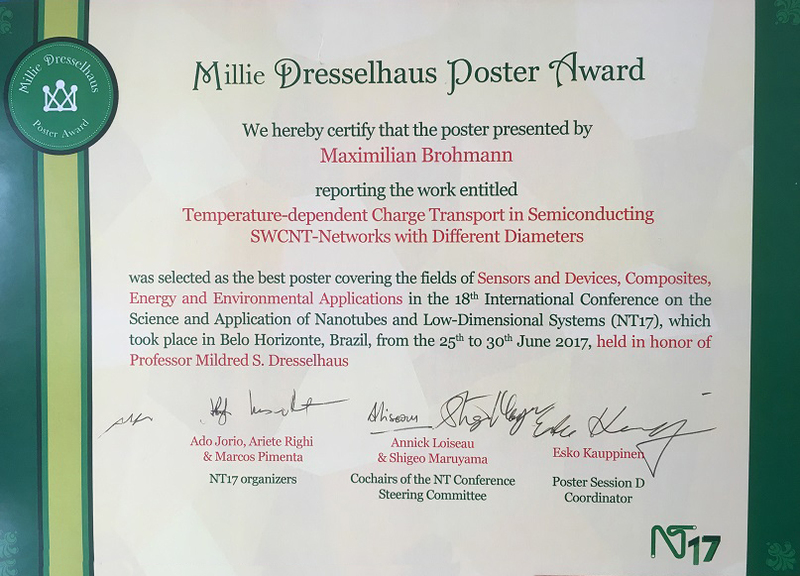 Max Brohmann won the Millie Dresselhaus Poster Award at the NT17 conference in Belo Horizonte (Brazil). Arko Graf won a Silver Graduate Student Award at the MRS Spring meeting in Phoenix. Congrats! 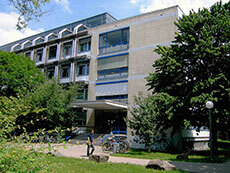 NMOE-Alumna Julia Schornbaum received the Dissertation Award of the Technical Faculty at the FAU Erlangen-Nürnberg. Congratulations! Arko Graf won the best presentation award at the European Optical Society Annual Meeting (EOSAM) 2016 in Berlin. Congratulations! Dr. Fabian Paulus and Dr. Katelyn Goetz join the NMOE group as postocs. Welcome! Austin, Benjamin, Caroline, Emma & Pengning. Dr. Claudia Backes has been selected for the prestigious Emmy-Noether Program of the DFG. Congratulations ! Dr. Thomas Higgins joins the NMOE group as a Marie-Curie Postdoc Fellow. Welcome Tom! The Nanomaterials for Optoelectronics (NMOE) group led by Prof. Dr. J. Zaumseil is an interdisciplinary research group of chemists, physicists and engineers. 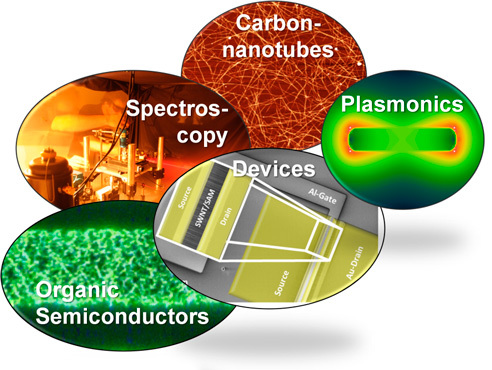 We are interested in unconventional, solution-processable semiconductors such as single-walled carbon nanotubes, conjugated polymers and quantum dots for (opto-)electronic devices (e.g. transistors). We investigate their charge transport properties and light-matter interaction with a wide range of techniques. The junior research group Physical Chemistry of Layered Nanomaterials (PhysChem2D) focuses on exploiting liquid-exfoliated layered, two-dimensional nanomaterials as versatile building blocks for further solution processing and supramolecular chemistry. These include for example transition metal dichalcogenides (MoS2, WSe2…), III-VI semiconductors (GaS) or black phosphorus. We apply a number of spectroscopic and microscopic techniques to both understand and tune the properties of a broad variety of layered materials by size and thickness control as well as chemical functionalisation. The activities of the Biosensor and Biomaterials Research Group are focused on a detailed understanding of the interaction of biomolecules with artificial surfaces, which is important for many medical, biochemical and biotechnological applications. Inter alia, we investigate new methods for the specific detection of dissolved molecules, the mechanisms of joint lubrication, and the impact of physicochemical surface parameters on protein adsorption and function. In this context, not only homogeneous but also chemically micro- and nanostructured surfaces are of major interest. By the use of acoustic wave-based and optical sensors, adsorption and binding processes are monitored in situ without the necessity of labeling the molecules. One of our major goals is the label-free in situ analysis of biospecific interactions in high-density peptide arrays. The derivatized surfaces are analyzed by surface analytical techniques such as infrared spectroscopy (FT-IRRAS, ATR-IR), X-ray photoelectron spectroscopy (XPS), scanning electron microscopy (SEM), atomic force microscopy (AFM), and enzyme-linked immunosorbent assays (ELISA). In addition, neutron and X-ray reflectometry is used to characterize solid/liquid interfaces as well as organic films and biological adsorbates. The investigations are directed towards a precise control of adsorption and binding processes via specific variation of surface properties. Latest research focuses on the development of optically responsive nano-composite layers for the label-free in situ detection of binding events in high-density peptide arrays, the contribution of lipids and polysaccharides to joint lubrication, the control of protein conformation on synthetic surfaces, and the set-up of a new neutron reflectometer with integrated ATR-IR spectroscopy at the Helmholtz Center Berlin (HZB). The latter instrument has been optimized for the in situ characterization of biofunctional interfaces and is accessible to a large community of users. The main focal points of the Surface Science & Analytics group are (1) basic understanding of self-assembly phenomena in ultrathin organic films on metal, semiconductor, and insulator substrates; (2) modification of self-assembling monolayers (SAMs) by X-rays, electron irradiation, and plasma; (3) SAM-based lithography; (4) design of monomolecular films for different applications, ranging from the fabrication of sensors and catalytically active surfaces to molecular electronics; (5) X-ray and photoelectron microscopy characterization of ultrathin organic layers and polymer films; (6) adsorption of organic molecules on organic surfaces; (7) adsorption of metals and fabrication of ultrathin metallic films on monomolecular organic support; (8) spectroscopic characterization of liquids, and (9) spectroscopic characterization of biologically-relevant objects and macromolecules in their natural environment. The related activities take their course within several BMBF, DFG, and DAAD projects and include both experiments in the home laboratory and XPS, NEXAFS, HRXPS, XES, PSD, XPM, and XAM studies performed at different synchrotron radiation facilities, including BESSY II in Berlin, MAX-Lab in Lund (Sweden), ALS in Berkeley (USA), and NSRRC in Hsinchu (Taiwan). In the home laboratory, we have several specially designed, multi-technique UHV installations on our disposal. These machines consist of several analysis, preparation, and load-lock chambers connected by efficient sample transfer systems. They are equipped with a broad variety of complementary tools for surface analytics, such as, e.g., low-energy electron diffraction, thermal programmed desorption, X-ray and ultraviolet photoelectron spectroscopy, ion scattering spectroscopy, work function measurements, and photoelectron emission microscopy. In addition to the above scientific activities, the group conducts and participates in different industrial projects with national and international partners. The group is involved in a broad world-wide scientific cooperation with partners from Germany, Italy, Sweden, Netherlands, Switzerland, Poland, Russia, Israel, USA, Taiwan, and Japan. During last five years, we have published and submitted 67 manuscripts in reviewed, high-rating journals and presented 88 contributions at different national and international conferences.